Are you missing the mark when it comes to producing content that sells? Sure, you may have hundreds or thousands of daily visitors to your site, but is your content turning those valuable people into customers? If your content marketing campaign is looking like it’s a big flop, doing some simple tricks to your content can make a big difference in your sales. It’s everywhere. From the headlines in a magazine to the new stories on TV, copywriting persuades people to take a particular action. And for those of you looking to up your marketing efforts and stand out, copywriting can be your new best friend. When people come to your site and are making the decision to opt-in to your email list – and aren’t sure they’re going to sign-up – your copywriting tactics can seal the deal. You may think you need a copywriter on staff to pull this off, but you can learn simple yet effective copywriting tactics to ignite your copy and make your content marketing efforts fruitful. At the end of the day, you’ll have high-converting content that will improve your conversion rate – if you do it right. But, before you try out these copywriting tricks, let’s talk about one important thing to remember about your copy. Your copy, whether it’s for an email autoresponder, landing page, blog, or opt-in, has to be easy to read. You want to use simple words and brief sentences. When considering only about 20-28% of users actually read anything on a web page, using basic writing is essential to yielding a higher ROI. To find out if your content has high readability, try using a readability score calculator. Put in your text, URL, PDF or bulk items (last two are paid services) and see how easy your content is to read. If your content has big complex words, you will receive a higher grade level. 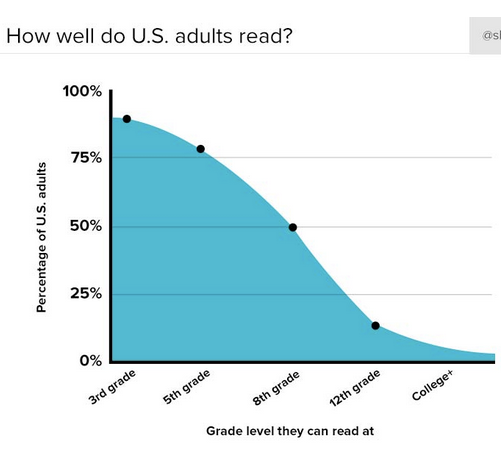 You might find it surprising most American adults read at a 4th-grade level and only half of them read at an 8th-grade level. Even Ernest Hemingway’s most outstanding short novel, The Old Man and the Sea, has a 4th-grade reading level. And many bloggers, including influencers Neil Patel of Quicksprout and Brian Dean of Backlinko, write content at a 4th-grade reading level. By having casual copy that’s conversational, simple and direct you’ll not only keep people interested, but you’ll have them coming back again and again. Let’s look at three copywriting tricks to help give your content the boost it needs to convert. And if your headline doesn’t pique the interest of the reader, up to 80% of people may not read past it. 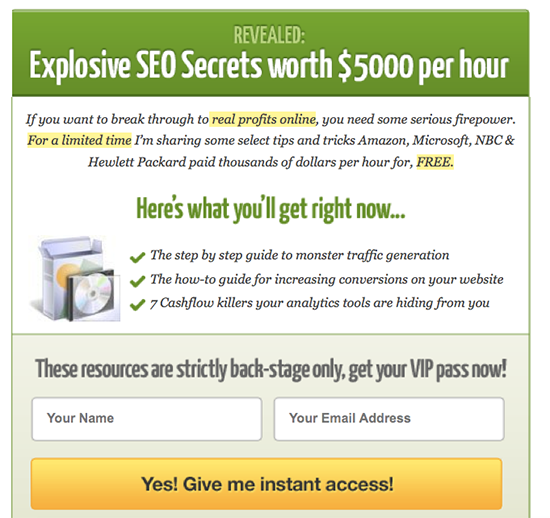 Your headline is the start of your lead generation funnel. You’re vying for the attention of your audience. They’re busy and have a short attention span when they’re online, so your headline needs to stop them in their tracks. So, how can you capture your audience? Your headline needs to speak directly to your target audience. It’s often the first thing people see on your website and because of this, it needs to have a strong value proposition. A value proposition clearly describes what your business offers. You know exactly what you’re going to get when you sign up for Aweber’s services. 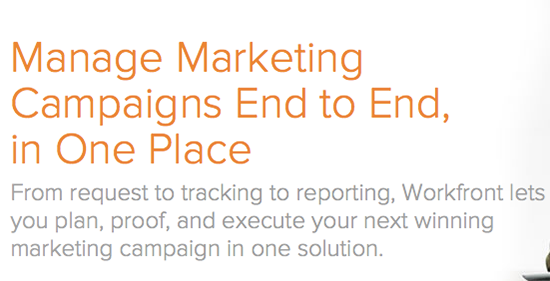 Aweber knows people don’t want to spend hours and money figuring out another tool for their marketing campaign. So, they make it easy for customers to know that. People like numbers, and they like products and services that will give them more of something. When you use a metric measure, it can prove to be a powerful copywriting tactic. Adam doesn’t dance around traffic generation. Using an ultra-specific number he lets people know how much they can grow their own traffic. Knowing this will convince many visitors to sign up. Buyers have specific problems and they want a solution. They will go from site to site trying to find the answer. Your headline can tell a buyer how you can help them with a clear solution targeted towards them. By using their platform, you can live smarter with their help. While this isn’t too precise, they’ve paired their lead capture with an image of a mom holding a baby – talking to another young woman – in an orderly kitchen. Living smarter probably means being more organized, and you can be more organized with TaskRabbit. When you write your headline, you don’t always need to be precise, metric-based and show benefits. But, you should try to incorporate one of these elements – or a mix of them – to not only help you stand out, but to help you turn visitors into customers. My nifty time management app is the flexible and visual way to organize anything you do. Hamus is the best way to absorb content in the digital age. We deliver a groundbreaking way to read content on the web. Starfish Creations is a world-class company specializing in the creation of a time-tested project management system. Our innovative approach to productivity and efficiency makes our system one of a kind and useful for you. Where is the focus of these sentences? It’s on the company and what their product or service does. In no way are the copy examples showing you how using the product or service could benefit the customer. How is my business benefiting the customer? What does my product or service do to help a customer? Why would a customer purchase my product or service over another? The key is to make the focus on the customer, not on the company or on your incredible services. When you can show it’s all about your audience and not about your business, you will see an increase in traffic, sales or whichever metric you are going by for growth. So, when you are writing copy, try to focus on the implicit reasons to use your products or services, not the explicit reasons. Instead of Apple calling their first iPod a, 5GB MP3 Player, they found another way to add value to their customers. They marketed it as, 1,000 songs in your pocket. Instead of LinkedIn calling their social platform a social network for businesses, it speaks to their users – be great at what you do. In copywriting, a single word can make all the difference. And, if you want to market a product or service, knowing which words to use can make the difference between making money or twiddling your thumbs wondering where the money is. For example, online marketer Steven Macdonald works for a company that launched a trial version of their CRM software. He decided to test out different call to actions (CTA) by changing a word or two. He found Start Free Trial yielded twice as many sign-ups than with any other CTA. Simply changing from Get to Start, had a 123% higher conversion rate. As well, Marketing Experiments worked on optimizing Britannica Online’s landing page. 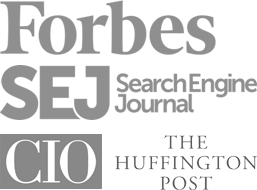 They found using Get to start their headline increased their conversion rate 103%. Power words evoke emotion, a sense of urgency, exclusivity, and curiosity. Use these words strategically. Putting out a newspaper ad with the heading, Free Boxer puppies, probably won’t get as many responses than if you had written, Boxer puppies, $100 each. Sometimes, free can mean low quality or inferior. Other times, if you can show visitors a perceived value that’s a limited offer, they will think they’re getting a lot for free. Remove filler words like: should, must, actually, a bit, and in order. Use strong action words like: blast, create, hurry, seize, or unlock. Having a few copywriting tricks up your sleeve is like having the key to unlocking your conversion rate. Simply changing one word in your headline or CTA can change how much growth your company will see. When you understand you should be showing the benefits – not the features – you’ll stop scratching your head wondering why no one is clicking or buying. And when you start sprinkling powerful, action-oriented words in your copy, you’ll quickly notice the extra attention your company is receiving. Now it’s your turn – tell us what copywriting tricks you’re using to give your content that extra boost it needs to sell.